Keywords: compression; tissue damage; bandage; multi-layer; venous leg ulcer; Leplace equation. Compression bandaging is the principal form of therapy for the treatment of venous leg ulcers. Bandages can cause tissue damage if applied incorrectly. Little information is available on the maximum pressure that bandages should apply, but a review of the literature suggests that this could be around 60 mmHg. A new type of bandaging system has been introduced that facilitates the application of therapeutically effective levels of compression whilst reducing the possibility of over compression. Graduated external compression is a key factor in the successful treatment of leg ulcers associated with venous insufficiency, but this form of therapy is not without risk if used inappropriately. Bandages applied with excessive tension can cause tissue damage leading to necrosis. However, to date, no information has been published on the levels of pressure that might be required to cause these adverse effects. A new type of bandage has recently been introduced that is designed to minimise the risk of tissue damage by controlling the amount of tension within the bandage fabric during application. This is achieved by the presence of an application guide printed on the bandage fabric, and the inclusion within the fabric of new elastomeric yarns with novel properties. The results of the present laboratory study suggest that the bandage appears to meet its design criteria, but highlights the importance of correct application to avoid the formation of excessive sub-bandage pressure. The application of sustained graduated compression is a key element in the prevention and treatment of leg ulcers caused by damaged or incompetent veins in the lower leg. Whilst compression hosiery is commonly used to prevent the development or recurrence of venous ulcers, elastic bandages and multi-layer bandaging systems remain the principal forms of treatment for active ulceration . The optimal value for the degree of pressure required remains a matter of some debate. Pressures of about 40 mmHg at the ankle are widely quoted in the literature for the prevention or treatment of venous leg ulcers, although some authorities recommend values significantly higher than this , . The effectiveness of compression bandaging depends upon the degree of pressure provided and, this in turn, is determined by a number of factors including the physical and elastomeric properties of the fabric, the size and shape of the limb, the skill or technique of the operator and, most importantly, the tension produced in the bandage fabric during the application process. The relationship between these variables is described by the Laplace equation, the derivation of which has been described in detail elsewhere . Assuming that a bandage of standard width is applied in the form of a spiral with a 50% overlap to a patient with a leg of relatively fixed dimensions, bandage tension is the only real variable in this equation, which illustrates the importance of this factor in the determination of sub-bandage pressure. Using the Laplace equation, values of sub-bandage pressure have been calculated for various combinations of limb circumference and bandage tension. These are shown in Table 1. The figures quoted in this matrix assume that two layers of bandage 10 cm wide have been applied with the stated tension to a leg of a specified diameter with a 50% overlap between turns. The values highlighted in green represent the target value of 40 mmHg +/-10% for each size of ankle. 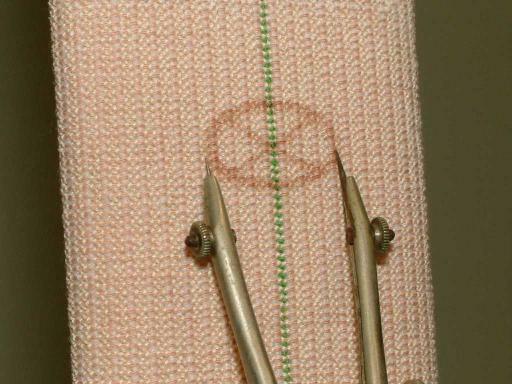 Unlike stockings or tubular bandages, where the relationship between extension (a function of limb diameter) and fabric tension is 'pre-programmed' into the product during the manufacturing process, the tension developed in most flat bandages during application is determined entirely by the operator. Studies have shown that the tension with which bandages are applied by different nurses varies significantly from person to person, although the pressure achieved by individuals following repeated application of a bandage is much more consistent . This variation has important implications for the degree of pressure applied and inevitably, therefore, the clinical effectiveness of the treatment. If the pressure achieved is too low, the treatment may be ineffective, but if the pressure is excessively high there is a real possibility of tissue damage and necrosis over vulnerable areas , , , , . Historically, attempts have been made to reduce the effects of operator variability by marking bandages with geometrical shapes that change from oblongs to squares when a particular level of extension (and therefore tension) has been applied to the fabric . This approach has been shown to significantly reduce inter-operator variability and produce more consistent levels of compression . The use of application guides, however, fails to address a second problem associated with the use of extensible bandages, specifically the effect of changes in extension on sub-bandage pressure. These can occur either during or after application - perhaps as a consequence of a decrease in limb size following elevation or a reduction in oedema. The effects that these changes have upon bandage tension, and therefore applied pressure, are determined by the physical characteristics of the fabric. This relationship may be examined in the laboratory using a constant-rate of traverse machine, an instrument that records the tension in a test sample whilst extending it at a predetermined rate. The relationship between extension and bandage tension obtained using this equipment can be expressed graphically as a load-extension curve (Figure 1). The curve has two separate components: the extension curve (shown in blue), which expresses the relationship between extension and tension as the bandage is extended or stretched; and the regain or retraction curve (shown in red), which records the same parameters as the bandage is allowed to return to recover or return to its unstretched state. These two curves are rarely super-imposable and the difference between them is termed 'hysteresis'. For a truly elastic material such as a piece of rubber or a coiled spring, a direct relationship exists between extension and applied force, resulting in a load extension curve that is virtually a straight line for a large part of its length with relatively little hysteresis. The elastomeric yarns used in some high compression bandages would, if tested in isolation, tend to perform in this way although some degree of hysteresis will still be evident. Once incorporated into a bandage fabric, however, their extensibility may be partially inhibited by frictional effects that take place between the non-elastomeric yarns, which may be formed from cotton, viscose or some other synthetic or hemi-synthetic polymer. Depending upon the method of construction, a significant part of the applied force may be dissipated on these textile components, particularly as the bandage is stretched for the first time when all the 'kinks' are removed from the textile yarns. Subsequent load extension curves do not show such a marked effect with a consequent reduction in hysteresis. The tension in elastomeric materials subjected to a sustained extension force gradually reduces over time, typically by 10-20% over a 24-hour period. Although most of this tension is lost in the first couple of hours, the process continues over an extended period at a much slower rate. This process is termed 'decay' and it represents a problem for manufacturers of elasticated fabrics such as compression bandages who wish to develop products that can deliver high levels of compression in-situ over an extended period. Thus a bandage designed to deliver a specific level of pressure after three days' constant use will initially have to be applied with higher pressure to allow for this natural decay in tension. Bandages that do not contain a significant amount of elastomer, but which rely upon heavily twisted textile yarns to provide a degree of elasticity, also exhibit decay and produce extensibility curves that show a very rapid change in tension for relatively small changes in extension, particularly on the important regain portion of the curve. Examples of load extensibility curves for two such bandages, a simple crepe-type bandage and Comprilan, an inelastic (short stretch) bandage, are shown in Figure 2 and Figure 3. With such bandages, small changes or variations in extension produced during or after application, result in marked changes in tension and therefore sub-bandage pressure. The elastic properties of crepe bandages tend to be extremely poor , often requiring frequent reapplication to achieve and maintain therapeutically active levels of pressure , . Bandages containing significant quantities of elastomer perform much better in this respect. These are also better able to maintain applied tension, and 'follow-in' as leg circumference is reduced with minimal effect upon sub-bandage pressure. Recently a new type of elastomer has been developed which, when incorporated into a bandage, is claimed to provide significant advantages over conventional products. When the bandage is stretched, the tension within it initially increases in a similar way to conventional materials. Reversible changes then take place in the chemical structure of the elastomeric polymer as a result of which, further extension of the bandage can be achieved with relatively little additional tension. This results in a marked decrease in the slope of the load extension curve. Application of the new bandage is further facilitated by the presence of a printed application guide that consists of an oval containing two intersecting lines that changes to a circle with the lines at right angles when the bandage is extended to the centre of its working range (Figure 4 and Figure 5). According to Laplace's law, limbs of different circumference require bandages to be applied with different levels of tension in order to achieve a consistent level of compression. This means that bandages containing the new elastomer must be produced in a range of sizes to suit legs of different dimensions. By controlling the number of elastomeric yarns used in their construction, it is possible to produce bandages that can be 'tuned' to deliver the required level of tension, and therefore pressure, on limbs of different dimensions. The present study was undertaken to examine the physical characteristics of the new bandages and determine their projected pressure profiles under simulated 'in-use' conditions. The bandages included in the study were the Proguide range produced by Smith and Nephew. The bandages are of woven construction and coated with a pressure sensitive hot melt adhesive in a ladder pattern to reduce slippage and keep the bandage system in place for extended periods. This adhesive is latex-free and does not contain colophony or other potential skin sensitisers. After conducting some initial studies to confirm that the performance of each type of bandage was consistent from roll to roll (data not shown), representative samples of each were placed in turn in the jaws of a constant rate of traverse machine (Instron) in computer-controlled, cyclical mode with a crosshead speed of 200 mm per minute and a jaw separation of 200 mm. Each sample was cycled three times between this value and a maximum length of 400 mm, equivalent to 100% extension. During this process, the geometry of the application aids was continuously monitored on both the extension and regain parts of the cycle by one operator and the value of extension at which the oval became a circle was recorded by a second operator from a digital display on the Instron. Judging the exact moment at which this occurs is prone to error in a dynamic situation such as this, so upon completion of each test, the bandage was slowly extended a fourth time using the Instron in manual mode until the application aids indicated that the required level of extension had been achieved. The bandage was then held at this measured extension and the tension recorded. Values of displacement and tension recorded for each bandage during the cycling process were downloaded and transferred into a spreadsheet for further examination. 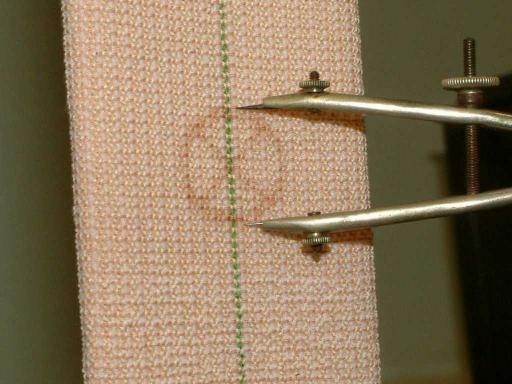 In a second series of tests, samples of each bandage were placed in the Instron and cycled once to a value equivalent to 100% extension then back to its original length. The bandage was then extended a second time to the extension value determined during the static test described above, and held at this extension for about 15 hours during which time the tension was recorded. Load extension curves for the three Proguide bandages together with those of a second compression bandage for comparison purposes (Setopress - SSL) are shown in Figures 6-9 (Figure 6, Figure 7, Figure 8, Figure 9). In all of these figures the blue line represents the first cycle and the red and yellow lines the second and third cycles respectively. The tension in each bandage sample corresponding to the extension values dictated by the application guide, determined during each stage of the cycling process, was abstracted from each of the various datasets. These values, together with the values obtained in the more easily-controlled static test, are recorded in Tables 2-4 (Table 2, Table 3, Table 4. This data reveal obvious differences in the percentage extension and tension values recorded during the extraction and retraction portions of each cycle. These differences are most pronounced in the bandage marked with the red line and least in the bandage with the green line. In each case there was also a marked difference between the bandage tensions obtained from the first extension curves and values determined subsequently. It is believed that these differences are due to the effects of the adhesive layer and interactions between the non-elastomeric textile components of the bandage fabric, which are present in higher proportions in the bandages designed for the smaller limbs. Within the limits of experimental error, given the problems of assessing the performance of the application guides in a bandage that is being continually subjected to movement, the tension value obtained from the static test was in each case comparable with that obtained from the retraction curves in the dynamic test although differences remained between the recorded extension values. The time-related changes in tension for the three Proguide bandages are shown in Figure 10. All show a marked reduction over the first 15 minutes followed by a more gradual reduction over the remaining period of the test. (The wave-like pattern in these curves is caused by the bandage yarns responding to small changes in relative humidity in the controlled environment room in which the testing is undertaken). >From the various tension values obtained during the testing process, the pressures each bandage would apply to limbs of different sizes were calculated and these are shown in Table 5. Within this table, several different tension and pressure values are quoted for each size of bandage. The first, described as 'maximum tension' determines the pressure that would be achieved if the bandage were to be gently extended to the point at which the oval guide became a circle and applied immediately to a limb of the stated circumference. The second, described as the 'initial tension', is the value obtained during the static test and equates to the tension that would be present in the bandage if it were to be slightly over-stretched and allowed to relax prior to application, ie the bandage is applied on the first regain curve not the first extension curve as above. The two remaining values quoted were abstracted from the decay testing, recorded tension and the calculated pressure that the bandage could be expected to achieve an arbitrary 4 and 15 hours after application. One of the key features claimed for the new bandage is the relatively shallow extensibility curve of the elastomer over the working range, which should ensure that minor changes in extension have little effect upon applied sub-bandage pressure. To determine the significance of this, the effect on bandage tension (and therefore sub-bandage pressure) of a 10% reduction in extension from 55-65% was determined from the third retraction curve of each bandage using the datasets collected previously (Table 6). The medical literature strongly suggests that although graduated external compression is a key factor in the successful treatment of leg ulcers associated with venous insufficiency, the optimum degree of pressure required remains a matter of some debate. Many authors have recommended a target value of 40 mmHg at the ankle, but this is an average figure and takes no account of the height or body mass of the individual concerned. Although it is generally accepted that pressures significantly below this target value may be of limited clinical efficacy, virtually no information is available on a safe upper limit for externally applied sustained compression. A few references are available that describe cases of tissue damage resulting in the formation of ulcers on the dorsum of the foot or tissue necrosis over the tibia caused by badly applied bandages, but these publications make no mention of the pressures that are required to cause these adverse effects. The evidence suggests that this damage occurs when bandages are applied with too much of an overlap, effectively resulting in three or even four layers of fabric over a particular point on a limb. If the bandage in question is applied with sufficient tension to achieve 40 mmHg with two layers of fabric, the additional layers could easily result in the production of 60 or even 80 mmHg overall. Not surprisingly, no clinical studies have been undertaken specifically to determine the amount of pressure that must be applied by a bandage to cause tissue damage to human legs, but some interesting information has been published on the effect of external pressure on tissue viability in the context of pressure ulcer prevention and this may have some relevance to this area. Bader  reviewed various published studies designed to determine the effects of compressive loading on the viability of human tissue using a variety of techniques. In one study, involving measurement of transcutaneous oxygen tension, considerable variation between subjects was recorded in the pressure required to achieve 50% of the uncompressed value (22-92 mmHg) but, in contrast, a pressure of 60 mmHg was found to produce arterial occlusion and virtually eliminate TcPO2 in all but three of the 17 subjects examined. Michel and Gillott  similarly reported that a pressure of 60 mmHg was found to arrest microcirculation in an animal model and inhibit clearance of radioactive Xenon-133 from the skin on the volar aspect of the forearm and in the parasacral region. In the absence of any conflicting or contradictory evidence, it therefore seems reasonable to adopt this value of 60 mmHg as a maximum upper limit for sub-bandage pressure, particularly if localised over bony prominences. The pressures that the bandages examined in the current study are predicted to achieve on limbs of different sizes are shown in Table 5. Excluding the theoretical maximum tension values, which can be avoided by slightly overstretching the bandage prior to application, these pressures range from 59 down to 37 mmHg immediately following application, progressively falling to a maximum of 52 mm Hg after 15 hours. As such, they fall below the proposed 60 mmHg upper limit. As might be expected from Laplace's law, the highest pressures are associated with the smallest limbs in each of the recommended ranges. For this reason, the manufacturer has recommended that for an ankle circumference of around 22 cm or 28 cm (the point at which there is a crossover between different kits) the bandage system should be used that is appropriate to the smaller limb circumference in each case to avoid the possibility of tissue damage. This means the use of a red kit in the case of a 22 cm ankle and yellow in the case of a 28cm ankle. The new Proguide range appears to represent a real advance in bandage technology, but like any powerful therapeutic tool it must be used appropriately by practitioners who have been adequately trained in its use. The novel properties of the elastomeric component of the new Proguide range significantly reduce the effects of limited changes in extension on sub-bandage pressure. Furthermore, the relatively shallow extensibility curve of the fabric combined with the presence of the application guides will undoubtedly reduce the effects of operator variability and ensure that the bandages perform in a consistent fashion, provided they are applied with no more than a 50% overlap to avoid pressure damage caused by three or more layers of bandage being produced at any point on the leg. The aim of the manufacturer to produce a product that delivers clinically effective compression over an extended period has inevitably meant that the bandage has been designed to initially deliver pressures around the upper limit of the range that is currently recommended for the treatment of venous disease to allow for the decay in pressure that will inevitably occur over time. As with all compression bandages, inappropriate or incorrect application can easily result in pressures that exceed these recommended values, with the potential to cause tissue damage over bony prominences unless these are very well protected. Whichever bandage is applied, the results of this study suggest that each bandage should be partially pre-stretched prior to application, particularly when bandaging limbs with a circumference towards the lower end of the recommended range. Provided that comprehensive education and training are given to potential users, it is considered that the new bandage should make an important contribution to the management of venous disease. This article is supported by an educational grant from Smith & Nephew. The views expressed in this article are those of the author and do not necessarily reflect those of Smith & Nephew. 1. EWMA Position Document. Understanding compression therapy. London: MEP, 2003. Available from URL: http://www.proguide.net. 2. Stemmer R, Marescaux J, Furderer C. Compression treatment of the lower extremities particularly with compression stockings. The Dermatologist 1980; 31: 355-65. 3. Burnand KG, Layer GT. Graduated elastic stockings. BMJ 1986; 293: 224-25. 4. Thomas S. The use of the Laplace equation in the calculation of sub-bandage pressure. EMWA Journal 2003; 3(1): Available from URL: http://www.worldwidewounds.com/2003/june/Thomas/Laplace-Bandages.html [online version in World Wide Wounds]. 5. Logan RA, Thomas S, Harding EF. A comparison of sub-bandage pressures produced by experienced and inexperienced bandagers. J Wound Care 1992; 1(3): 23-26. 6. Danner R, Partanen K, Partanen J, Kettunen K. Iatrogenic compartment syndrome, a follow up of four cases caused by elastic bandages. Clinical Neurology and Neurosurgery (Netherlands) 1989; 91(1): 37-43. 7. Callam MJ, Ruckley C, Dale JJ, Harper DR. Hazards of compression treatment of the leg: an estimate from Scottish surgeons. BMJ 1987; 294: 929-31. 8. Moffatt CJ. Compression bandaging - the state of the art. J Wound Care 1992; 1(1): 45-50. 9. McCollum C. Extensible bandages. BMJ 1992; 304: 520. 10. Thomas S. Extensible bandages [letter]. BMJ 1992; 304: 984-85. 11. Thomas S. High-compression bandages. J Wound Care 1996; 5(1): 40-43. 12. Thomas S, Wilde LG, Loveless P. Performance profiles of extensible bandages In: Proceedings of a symposium, Union Internationale de Phlebologie. Negus D, Jantet G, editors. London: John Libbey and Co, 1986; 16-20: 667-70. 13. Raj TB, Goddard M, Makin GS. How long do compression bandages maintain their pressure during ambulatory treatment of varicose veins? Br J Surg 1980; 67(2): 122-24. 14. Tennant WG, Park KGM, Ruckley CV. Testing compression bandages. Phlebology 1988; 3: 55-61. 15. Bader DL. Effects of compressive loading regimens on tissue viability In: Pressure Sores: Clinical Practice and Scientific Approach. Bader DL, editor. London: The Macmillan Press, 1990; 191-201. 16. Michel CC, Gillott H. Microvascular mechanisms in stasis and ischaemia In: Pressure Sores: Clinical Practice and Scientific Approach. Bader DL, editor. London: The Macmillan Press, 1990; 153-163.